Even with the most nebulously named of genres, there are still artists that leap to mind as vanguards and progenitors of the sound and image of that style. When it comes to the muddled mess of ‘indie,’ Superchunk is a band whose name is a constant – not only because of their steamroller, power-pop-punk sound, but also because of being the very definition of ‘indie’ – starting their own, successful record label and putting out album after album of uncompromising music. Every band has an album that people think most signifies the band and its work, and while critically it’s their sophomore effort, No Pocky for Kitty, that typically gets that nod, for me it’s always been 1994’s Foolish. 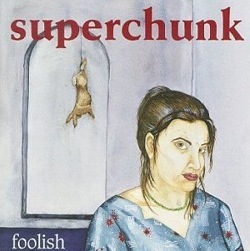 Foolish was Superchunk’s first album on their self-run Merge Records label and it is also one of Superchunk’s darkest outings thematically, largely due to the then recent breakup of bandmates Mac McCaughan and Laura Ballance. Opener “Like a Fool” is about half the pace of a heretofore normal Superchunk song. They had attempted something like this before with “Swallow That” from 1993’s On the Mouth, but that song not only stuck out like a sore thumb in an album full of pedal-to-the-floor bursts, but it just wasn’t a great song either. “Like a Fool” builds a melancholy and sometimes bitter tone for the album to come while also laying bare the caustic guitar melodies that would dominate the album’s sound. If anything, Foolish is an aurally consistent listen. McCaughan’s vocals are mired in a sonic maelstrom and in some cases become completely obscured – rational missives lost in a flurry of emotion and noise. The wash of guitars dominates the songs and risks making them all but run together – it’s a tribute to the fantastic set of songs themselves that they don’t. “Water Wings,” “Saving My Ticket,” “Why Do You Have to Put a Date On Everything” and “Without Blinking” are perfect examples of the traditional blitzkrieg Superchunk sound, each barreling through their running time with aplomb. Each has some memorable lyric, melody or riff that makes them stand out from one another. They are also tastefully spaced throughout the record, anchored by songs that pull the reigns on the tempo. + Download Superchunk via eMusic’s no risk 25 Free MP3 trial offer. I now know I am old as I consider this a new-ish release and it is 15 years old. Well said. This really was the start of the more well-rounded Superchunk albums, but the thing I always loved was that even when they went “soft” (if you even want to call it that) it was merely a few more diverse songs thrown in among traditionally epic Superchunk rock outs and they never really lost that fire and fury, which is why they rule. I appreciate this post ‘cos to me this is wear SC fell off the wagon, and not just because they “went soft” but just ‘cos I didn’t think they did it very well. On the Mouth was/is THE album for me, which probably has just as much to do with being 19 in 1993 as the music itself. When the Ribbon/Who Needs Light single came out I was pumped for what was to come and subsequently the First Part lead single got me jazzed for the album, but the Foolish really fell flat with me, as did most efforts following with a few standout tracks here and there. Honestly, I consider Foolish the “biggest let down” of an anticipated album ever. This saddens me ‘cos their early stuff is so important to me even now and more recent listens have still left me wondering what I’m missing; it’s obviously me not them. So, with a couple of years since my last attempt, I’ll dust this ditty off again, give her another spin and hope for magic. Aww man, you had to do this to me didn’t you!? Now I must dive into the wealth of music that is Superchunk. I’m going to need another job and a vacation…. I have to agree with Will G about “On The Mouth” A GREAT Record! I love all Superchunk, and Foolish was, for me, an album that kinda changed directions for the band. This was not a bad thing, just a change. No Pocky For Kitty – Great also. But now looking at all the records, I have a soft spot for later records like Here’s Where The Strings Come In and Come Pick Me Up also. So anyway, thanks for a great post about a great band. I am jealous of any newcomers to the band that read this post and start exploring Superchunk. P.S. – I saw Superchunk open for Teenage Fanclub at First Avenue in Mpls. in 1991 – your right – I am getting old(er)! While I’ve always preferred “On the Mouth”, a few weeks ago I listened to Foolish a couple times on a drive from NC to Cincinnati and back. While I feel like it’s a bit too long (the last few tracks don’t do much for me), I listened to the first 30 min multiple times and ended up putting “The First Part” on repeat. If you’re interested in getting access to review tracks, let me know and I’ll put you in touch with the site administrator. I have to disagree with Jeff and TheVandals… though I also loved “On the Mouth,” this one is definitely my favorite Superchunk album. The use of dual guitars on this record…. ah, so nice! I come back to “Foolish” far more than any of their others. And this on the day they at last release some new material! I’m with you on Here’s Where The Strings”. I mean, this was a singles/offcuts comp.. and p’s all over most other bands ‘proper’ releases. Genius. The guitar work on the ‘new’ stuff is fantastic. Knock Knock Knock is an instant ‘Chunk classic! Will someone please encourage them to come back to Europe if we promise to treat them better this time…? I’ll throw in my two cents about their most recent full length. I really enjoy (and have since day one) Here’s to Shutting Up. It may just be the day and time I got it (I was studying abroad in London when it was released and that was also where I saw them live for the first time), but I think it’s a really good record. The title track, “Late Century Dream,” and “Art Class” (especially, “Art Class”) are dynamic examples of them at their late period prime. It’s good to see people seem to agree that Foolish was an important turning point for the band – whether they think it was for the best or not. I started school in Boston when they released this and went to a show with all our friends where they did like 4 songs such a cool experience. Superchunk changed my life thanks Mac. Great Band, Thanks For Sharing! !